Sebastián de Vivanco was born in Ávila, probably in 1551. He became a choirboy at the cathedral, briefly a companion of Tomás Luis de Victoria to whom he was junior by some two years. They were under the tutelage of Bernardino de Ribera and his successor Juan Navarro. As a youth Vivanco progressed as a musician and studied for the priesthood. Victoria went to Rome and stayed there for two decades; Vivanco’s life is obscure until his appointment as maestro at Lleida (Lérida), a Catalan city in whose language and customs he was probably uncomfortable. He left after three years, dismissed, but with ‘no discredit to his leaving’. He returned to Old Castile, and became maestro de capilla at Segovia, then a decade later at his home city of Ávila. Briefly tempted to a post at Seville, he changed his mind and went home. There he stayed until he won the prestigious position of maestro at Salamanca Cathedral in 1602. The next year he was awarded a Master’s degree at the university, and was appointed catedratico de prima (morning professor), succeeding Bernardo Clavijo del Castillo who entered royal service in Madrid. Vivanco had achieved the peak of his career. He was soon to find that rare thing in Spain, a printer-publisher of music: Artus Taberniel (Arthur Tavernier of Antwerp) had been established at Salamanca as the university printer. 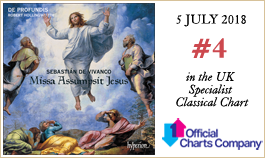 In 1607, 1608 and 1610, three great collections of Vivanco’s music saw the light of day. In 1608 Taberniel printed a collection of ten Mass Ordinaries, Vivanco’s Liber Missarum. It begins with a setting for six voice parts and ends with one for eight. There are seven for four voices and one for five—the Mass recorded here. Missa Assumpsit Jesus is presented in a context of the Feast of the Transfiguration of Our Lord (6 August). 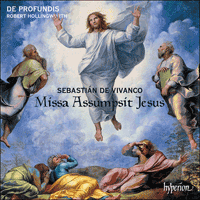 The title and the main melodic basis of the Mass is taken from Vivanco’s own motet Assumpsit Jesus Petrum, which tells how Jesus took Peter along with James and John up to a high place where he was transfigured, and there endorsed by God’s voice of approval from a high cloud. The first part of this text served as a Vespers antiphon for the Transfiguration feast, but Vivanco originally wrote it in full as a Gospel motet for the Second Sunday of Lent. Here we use it as an extra-liturgical motet in place of the Offertory. The plainchant of the Introit, Gradual and Alleluia verse are taken from the Roman Gradual published in 1614, as are the responses and Preface before the Sanctus. The deeply devotional Eucharistic motet O sacrum convivium (to the words of Thomas Aquinas) concludes our choice of Mass music. Vivanco was an enthusiast for complex canons. The Osanna II for seven voices has three of them derived from a diagram of music notation with recondite Latin instructions. The notation has signs for entries and departures, plus mensural time signatures, some reversed, all governing the voices’ motions, forward and backwards, in full time values and in diminution (doubling of speed), all using a nine-note version of the main theme of the Mass, itself derived from the opening melodic line of the motet Assumpsit Jesus: a rich but impenetrable aural experience. It is a relief to hear the crystal clear canons (of imitation at the unison) for the top voices in the Credo’s ‘Crucifixus’ and in the Agnus Dei. Following the Dismissal, ‘Go, Mass is ended. Thanks be to God’, we present motets of penitence and mourning followed by three that honour the Blessed Virgin. De profundis, the Psalmist’s cry ‘out of the depths’, is a brief setting in which the composer uses some agitated figures, enhanced chromatically, to plead for mercy. On a grander scale, Versa est in luctum mourns the passing of some important person. Vivanco’s motet is one of a contemporaneous trio of six-voiced settings of this text (the Office of the Dead): the others are Alonso Lobo’s for Philip II from 1598, and Victoria’s for the dowager Empress Maria from 1603. Vivanco’s was not included in his book of 1610 and may have been composed a few years later. The Marian motets have the composer in joyful mood. The two that have texts from the biblical Song of Songs are for two equal choirs. They both begin with flowing imitative entries in typical sixteenth century polyphonic style, but soon they settle into a declamatory mode, mostly ‘call-and-answer’ from choir to choir. The rhythmic variety of patter, sometimes syncopated, is very lively. Vivanco uses these resources to change pace. Some grandeur is achieved when the choirs’ eight voices come together in rich sonority. The Songs were drawn from the Vulgate Bible because the Church interpreted them as depicting the mutual love of Christ and his spouse the Church. As Marian devotion increased, many passages became associated with the Blessed Virgin: Vivanco’s printed heading for Veni, dilecte mi is ‘De Beatae Mariae’. There are many delightful touches in Surge, propera, amica mea: those treasured words ‘hiems transiit, imber abiit et recessit’ (‘now the winter is past, the rain is over and gone’) are set in gentle repetition and then in full choir harmony, into which spring suddenly bursts—‘Flores apparuerunt in terra nostra’ (‘The flowers appear in our land’)—in rapid-fire parlando style. Assumpta est Maria is something else. The text is the first antiphon at Vespers of the Feast of the Assumption of the Blessed Virgin Mary. Vivanco’s motet could have been used to replace the plainsong that would follow the Psalm Dixit Dominus; more likely is its extra-liturgical use on that joyful feast, for it has an added Alleluia. It is written for six voices, three of them equal superius parts that continually cross, weaving around each other to shimmering effect. Two tenors supported by a baritone complete the six in the same way, constantly in close imitation. This is an unbroken web of lively counterpoint, very bright, with joyous leaps, syncopations and runs. The recording ends with a setting of the Marian canticle, the Magnificat. The Liber Magnificarum (1607) consisted of two complete cycles of polyphonic verses to be sung in alternation with plainsong. One cycle has polyphony for the odd-numbered verses, the other sets polyphony for the even verses. There are eight settings to each cycle, employing each of the eight plainchant recitation tones. To these sixteen Magnificats Vivanco added two more, one at the beginning of the book and one at the end: an extra ‘primi toni’ for six voices and an ‘octavi toni’ for eight voices. The latter has gained some currency in a modern edition, recorded by Westminster Cathedral Choir. The former ends this programme. The Magnificat primi toni is for six voices (with double superius and tenor parts), reduced in verse five, ‘Et misericordia’, to just four, expanding to eight in the doxology ‘Gloria Patri’; in that final verse Vivanco plays his tricks. He presents three canons: one instructs a voice to be copied an octave higher, omitting all the smallest notes and the longest; one of the tenor parts is to be imitated at the fourth above; the bass voice is to be imitated by another bass who must reverse all the intervals, going down when the leader goes up, and vice versa, singing three bars behind. All very clever, but you will probably hear just a gorgeous sonic tapestry. Sebastián de Vivanco est né à Ávila, sans doute en 1551. Il devint petit chanteur à la cathédrale, où il fut brièvement le compagnon de Tomás Luis de Victoria, son aîné de deux ans, sous la tutelle de Bernardino de Ribera et de son successeur Juan Navarro. Dans sa jeunesse, Vivanco progressa comme musicien et fit des études pour devenir prêtre. Victoria partit pour Rome et y resta pendant vingt ans; la vie de Vivanco est peu connue jusqu’à sa nomination comme maestro à Lleida (Lérida), ville catalane dont il maîtrisait sans doute assez mal la langue et les coutumes. Il partit trois ans plus tard, licencié, mais sans «aucun discrédit sur son départ». Il retourna en Vieille Castille et devint maestro de capilla à Ségovie, puis, dix ans plus tard, dans sa ville natale d’Ávila. Tenté un bref instant par un poste à Séville, il changea d’avis et rentra chez lui où il resta jusqu’à ce qu’il obtienne le poste prestigieux de maestro à la cathédrale de Salamanque, en 1602. L’année suivante, il se vit décerner une maîtrise à l’université et fut nommé catedratico de prima (professeur du matin), succédant à Bernardo Clavijo del Castillo appelé au service royal à Madrid. Vivanco avait atteint le sommet de sa carrière. Il allait bientôt trouver cette chose rare en Espagne, un imprimeur-éditeur de musique: Artus Taberniel (Arthur Tavernier d’Anvers) qui s’était établi à Salamanque comme imprimeur de l’université. En 1607, 1608 et 1610, trois grands recueils de musique de Vivanco virent le jour. En 1608, Taberniel imprima un recueil de dix Ordinaires de la messe, le Liber Missarum de Vivanco. Il commence par une messe à six parties vocales et se termine par une à huit voix. Sept sont écrites à quatre voix, une à cinq voix—la Messe enregistrée ici. La Missa Assumpsit Jesus est présentée dans le contexte de la fête de la Transfiguration de Notre Seigneur (6 août). Le titre et la principale base mélodique de cette messe sont empruntés au propre motet de Vivanco Assumpsit Jesus Petrum, qui raconte comment Jésus emmena Pierre avec Jacques et Jean sur une haute montagne où il fut transfiguré et avalisé par la voix de Dieu émanant de la nuée. La première partie de ce texte servit d’antienne de Vêpres pour la fête de la Transfiguration, mais à l’origine Vivanco l’avait entièrement mis en musique sous forme d’évangile chanté (motet) pour le deuxième dimanche de Carême. Ici, nous l’utilisons comme un motet extra-liturgique à la place de l’Offertoire. Le plain-chant de l’Introït, du Graduel et de l’Alléluia est emprunté au Graduel romain publié en 1614, de même que les répons et la Préface avant le Sanctus. Le motet eucharistique très dévotionnel O sacrum convivium (sur le texte de Thomas d’Aquin) conclut notre choix de musique pour cette messe. Vivanco avait une prédilection pour les canons complexes. L’Hosanna II à sept voix en comporte trois, dérivés d’un schéma de notation musicale, qui comporte des instructions abstruses en latin. Il y a dans la notation des signes pour les entrées et les départs, ainsi que des chiffres indicateurs de mesure mensuralistes, certains inversés, déterminant tous le mouvement des voix, en avant et en arrière, en valeurs non diminuées ou diminuées (deux fois plus vite), utilisant tous une version à neuf notes du thème principal de la Messe, lui-même dérivé de la ligne mélodique initiale du motet Assumpsit Jesus: une expérience auditive riche mais inaccessible. C’est un soulagement d’entendre les canons cristallins (en imitation à l’unisson) confiés aux voix aiguës dans le «Crucifixus» du Credo et dans l’Agnus Dei. Après l’Envoi, «Allez, la messe est dite. Rendons grâce à Dieu», nous présentons des motets de pénitence et de deuil, suivis de trois qui honorent la Sainte Vierge. Dans le bref De profundis, le cri «des profondeurs» du psalmiste, le compositeur utilise des figures agitées, renforcées chromatiquement, pour implorer la clémence. À plus grande échelle, Versa est in luctum pleure la disparition d’une personne importante. Le motet de Vivanco fait partie d’un trio contemporain de musique à six voix écrite sur ce texte (l’Office des morts): les autres sont celui d’Alonso Lobo pour Philippe II (1598) et celui de Victoria pour l’impératrice douairière Maria (1603). Le motet de Vivanco ne figurait pas dans son livre de 1610 et fut peut-être composé quelques années plus tard. Dans ses motets mariaux, le compositeur est joyeux. Les deux motets écrits sur des textes empruntés au Cantique des cantiques biblique s’adressent à deux chœurs égaux. Ils commencent tous deux par des entrées imitatives fluides dans un style polyphonique typique du XVIe siècle, mais ils passent bientôt à un mode déclamatoire, essentiellement «question et réponse» de chœur à chœur. La variété rythmique de ce bavardage, parfois syncopé, est très animée. Vivanco utilise ces ressources pour changer d’allure. Il atteint à la grandeur lorsque les huit voix du chœur s’unissent dans une riche sonorité. Les Chants furent tirés de la Vulgate car l’Église les interprétait comme dépeignant l’amour mutuel du Christ et de son épouse l’Église. Avec le développement de la dévotion à Marie, beaucoup de passages furent associés à la Sainte Vierge: le titre imprimé pour le Veni, dilecte mi de Vivanco est «De Beatae Mariae». Il y a de nombreuses touches charmantes dans Surge, propera, amica mea: ces précieuses paroles «hiems transiit, imber abiit et recessit» («déjà l’hiver est passé, la pluie s’en est allée») sont mises en musique en douce répétition, puis dans une harmonie à plein chœur, le printemps éclate soudain et—«Flores apparuerunt in terra nostra» («les fleurs apparaissent sur notre terre»)—dans un style parlando rapide. Assumpta est Maria est autre chose. Le texte est la première antienne des Vêpres de la Fête de l’Assomption de la Sainte Vierge Marie. Le motet de Vivanco aurait pu être utilisé pour remplacer le plain-chant qui devait suivre le psaume Dixit Dominus; mais son usage extra-liturgique le jour de cette fête joyeuse est plus probable, car il comporte un Alléluia ajouté. Il est écrit à six voix, dont trois sont des parties égales de superius qui se croisent continuellement, serpentant les unes autour des autres avec un effet chatoyant. Deux ténors soutenus par un baryton complètent les six de la même manière, constamment en imitation étroite. C’est un tissu ininterrompu de contrepoint animé, très brillant, avec des sauts joyeux, des syncopes et des traits. Cet enregistrement s’achève avec une version du cantique marial Magnificat. Le Liber Magnificarum (1607) se composait de deux cycles complets de versets polyphoniques à chanter en alternance avec le plain-chant. L’un de ces cycles a la polyphonie pour les versets impairs, l’autre pour les versets pairs. Chaque cycle est mis en musique huit fois, sur chacun des huit tons de récitation de plain-chant. À ces seize Magnificat, Vivanco en ajouta deux autres, un au début du livre et un à la fin: un «primi toni» supplémentaire à six voix et un «octavi toni» à huit voix. Ce dernier a été accrédité dans une édition moderne, enregistré par le Chœur de la Cathédrale de Westminster. Le premier conclut ce programme. Le Magnificat primi toni est à six voix (avec doubles parties de superius et de ténor), réduit à quatre voix dans le verset cinq, «Et misericordia», et étendu à huit voix dans la doxologie «Gloria Patri»; dans ce verset final, Vivanco nous joue un tour. Il présente trois canons: dans l’un d’entre eux, une voix doit être doublée à l’octave supérieure, en omettant l’ensemble des notes les plus courtes et les plus longues; une des parties de ténor doit être imitée à la quarte au-dessus; la voix de basse doit être imitée par une autre basse qui doit inverser tous les intervalles, en descendant lorsque le meneur monte et inversement, en chantant avec trois mesures de décalage en retard. Tout cela est très ingénieux, mais vous n’entendrez probablement qu’un sublime mélange sonore. Sebastián de Vivanco wurde wahrscheinlich 1551 in Ávila geboren. Er kam als Chorknabe an die Kathedrale und war für kurze Zeit ein Gefährte des etwa zwei Jahre älteren Tomás Luis de Victoria. Sie wurden von Bernardino de Ribera und dann von dessen Nachfolger Juan Navarro unterrichtet. In seiner Jugend machte Vivanco als Musiker entscheidende Fortschritte und bereitete sich auf das Priesteramt vor. Victoria ging nach Rom und blieb dort zwei Jahrzehnte lang; zu Vivancos Leben ist kaum etwas bekannt, bis er die Kapellmeisterstelle an der Kathedrale von Lleida (Lérida) antrat—eine katalanische Stadt, deren Sprache und Bräuche ihm wahrscheinlich fremd waren. Drei Jahre später verließ er die Stadt wieder, nachdem er entlassen, jedoch dabei „nicht diskreditiert“ worden war. Er kehrte nach Altkastilien zurück und wurde maestro de capilla in Segovia, und zehn Jahre später dann in seiner Heimatstadt Ávila. Kurzzeitig überlegte er, eine Stelle in Sevilla anzunehmen, besann sich aber schließlich eines anderen und zog wieder heimwärts. Dort blieb er, bis er 1602 die prestigeträchtige Kapellmeisterstelle an der Kathedrale zu Salamanca antrat. Im folgenden Jahr wurde er von der Universität mit dem Magistertitel ausgezeichnet und als Nachfolger von Bernardo Clavijo del Castillo, der in Madrid in den königlichen Dienst gegangen war, zum catedratico de prima (Morgen-Professor) ernannt. Damit hatte Vivanco den Höhepunkt seiner Karriere erreicht. Bald sollte er auch einen Notendrucker und -verleger finden, von denen es in Spanien nur sehr wenige gab: Artus Taberniel (Arthur Tavernier aus Antwerpen) hatte sich in Salamanca als Universitätsdrucker etabliert. 1607, 1608 und 1610 erschienen drei große Sammlungen der Werke Vivancos. 1608 druckte Taberniel eine Sammlung von zehn Messordinarien: Vivancos Liber Missarum. Es beginnt mit einer Vertonung für sechs Singstimmen und endet mit einer für acht. Zudem gibt es sieben Vertonungen für vier Stimmen sowie eine für fünf—die Letztere ist die hier vorliegende Messe. Die Missa Assumpsit Jesus erscheint im Kontext des Verklärungsfests Christi (6. August). Der Titel und die Hauptgrundlage für die Melodie der Messe stammen aus Vivancos Motette Assumpsit Jesus Petrum, in der erzählt wird, wie Jesus die Jünger Petrus, Jakobus und Johannes auf einen hohen Berg führte, wo seine Verklärung stattfand und Gottes Billigung von einer hohen Wolke erklang. Der erste Teil dieses Texts diente als Vesper-Antiphon für den Festtag der Verklärung, doch setzte Vivanco ihn erstmals in vollständiger Form als Evangeliumsmotette für den zweiten Fastensonntag ein. Hier verwenden wir das Stück als außerliturgische Motette anstelle des Offertoriums. Die Cantus-planus-Verse des Introitus, Graduale und Alleluia stammen aus dem Graduale Romanum von 1614, ebenso wie die Responsorien und die Präfation vor dem Sanctus. Die zutiefst andächtige Eucharistiemotette O sacrum convivium (zu einem Text von Thomas von Aquin) schließt unsere Auswahl von Messkompositionen ab. Vivanco begeisterte sich besonders für komplexe Kanons. Im siebenstimmigen Osanna II sind drei Stimmen aus einem Notations-Diagramm abgeleitet, das mit unergründlichen lateinischen Anweisungen versehen ist. In der Notation finden sich Zeichen für Einsätze und Schlüsse, sowie Mensurzeichen, einige in umgekehrter Form, die alle die Stimmbewegungen steuern, vor und zurück, in vollen Notenwerten und in Diminution (Tempoverdopplung), wobei alle eine 9-tönige Version des Hauptthemas der Messe verwenden, die ihrerseits von der Anfangsmelodie der Motette Assumpsit Jesus abstammt: ein üppiges, jedoch undurchdringliches Hörerlebnis. Im Gegensatz dazu muten beim Hören die glasklaren Einklangskanons der Oberstimmen im „Crucifixus“ des Credo sowie im Agnus Dei geradezu erleichternd an. Nach der Entlassung, „Gehet hin in Frieden.—Dank sei Gott, dem Herrn“, präsentieren wir Motetten der Buße und Trauer, sowie drei Motetten, die der Heiligen Jungfrau gewidmet sind. De profundis, der Ruf des Psalmisten „aus der Tiefen“, ist eine kurze Vertonung, in der der Komponist mehrere erregte und chromatisch erweiterte Figuren verwendet, mit denen um Gnade gefleht wird. Versa est in luctum ist größer angelegt und beklagt den Tod einer wichtigen Person. Vivancos Motette ist eine von insgesamt drei sechsstimmigen Vertonungen dieses Texts (das Totenoffizium), die um die gleiche Zeit entstanden: die anderen sind Alonso Lobos Komposition für Philipp II. von 1598 und Victorias Werk für die Kaiserwitwe Maria aus dem Jahr 1603. Vivancos Werk taucht nicht in seinem Band von 1610 auf—es ist möglich, dass er es einige Jahre später komponierte. In den Marianischen Motetten zeigt sich der Komponist von seiner sonnigen Seite. Die beiden Werke, denen Texte aus dem alttestamentarischen Hohelied zugrunde liegen, sind jeweils für zwei gleiche Chöre angelegt. Sie beginnen beide mit fließenden imitativen Einsätzen in dem für das 16. Jahrhundert typischen polyphonen Satz, gehen dann aber bald in einen deklamatorischen Stil über, der größtenteils als Ruf-Antwort-Form zwischen den beiden Chören zu charakterisieren ist. Die rhythmische Vielfalt der „Unterhaltung“, zum Teil synkopiert, ist sehr lebhaft. Vivanco macht davon Gebrauch, um die Gangart zu wechseln. Wenn die acht Stimmen des Chors in reicher Klangfülle zusammenkommen, stellt sich eine gewisse Erhabenheit ein. Die Texte aus dem Hohelied wurden der Vulgata entnommen, da die Kirche sie als Darstellung der gegenseitigen Liebe zwischen Christus und seiner Ehegattin, der Kirche, interpretierte. Als die Marienverehrung zunahm, wurden viele Passagen daraus mit der Heiligen Jungfrau in Verbindung gebracht: Vivancos gedruckte Überschrift für Veni, dilecte mi lautet „De Beatae Mariae“. In Surge, propera, amica mea finden sich viele reizvolle Feinheiten: jene schönen Worte „hiems transiit, imber abiit et recessit“ („Schon ist der Winter vergangen, und der Regen ist fortgezogen“) sind mit sanften Wiederholungen und dann mit vollstimmigem Chorsatz vertont, in den der Frühling plötzlich in rasantem Parlando hineinbricht: „Flores apparuerunt“ („die Blumen sind erschienen“). Assumpta est Maria ist etwas ganz anderes. Der Text ist die erste Antiphon des Vespergottesdienstes zu Mariä Himmelfahrt. Es ist möglich, dass Vivancos Motette den Cantus planus ersetzte, der normalerweise auf den Psalm Dixit Dominus folgt; wahrscheinlicher jedoch ist, dass sie außerhalb der Liturgie zu diesem fröhlichen Festtag erklang, da sie mit einem angefügten Alleluia endet. Die Motette ist für sechs Stimmen angelegt, von denen drei jeweils gleichberechtigte Superius-Stimmen sind, die sich fortwährend umeinanderwinden und überkreuzen, was eine schillernde Wirkung hat. Dazu treten zwei Tenöre und ein Bariton, die ebenso geführt werden und sich beständig imitieren. Es ist dies ein ungebrochenes Netz eines lebhaften, leuchtenden Kontrapunkts mit fröhlichen Sprüngen, Synkopen und Läufen. Die vorliegende Aufnahme wird mit einer Vertonung des Magnificat, der Lobgesang Marias, abgeschlossen. Das Liber Magnificarum (1607) bestand aus zwei vollständigen Zyklen von polyphonen Strophen, die im Wechsel mit Cantus-planus-Strophen zu singen waren. In dem einen Zyklus sind die ungeradzahligen Strophen polyphon gesetzt, im anderen die geradzahligen Strophen. Die beiden Zyklen umfassen jeweils acht Vertonungen, in denen die acht Psalmtöne nacheinander zum Einsatz kommen. Diesen 16 Magnificat-Vertonungen fügte Vivanco zwei weitere hinzu—eine stellte er an den Anfang (nämlich „primi toni“ zu sechs Stimmen), die andere („octavi toni“ zu acht Stimmen) ans Ende des Bandes. Die Letztere hat dank einer modernen Edition und einer Aufnahme durch den Westminster Cathedral Choir etwas Verbreitung gefunden. Die Erstere beendet das vorliegende Programm. Das Magnificat primi toni ist für sechs Stimmen angelegt (wobei die Superius- und die Tenor-Stimme jeweils verdoppelt sind), was in der fünften Strophe, „Et misericordia“, auf nur vier reduziert, im Lobgesang „Gloria Patri“ hingegen auf acht ausgedehnt wird—in jener Schlussstrophe spielt Vivanco seine Streiche. Er stellt drei Kanons vor: in einem soll eine Stimme eine Oktave höher wiedergegeben werden, wobei die schnellsten und die längsten Noten ausgelassen werden; eine der Tenorstimmen soll eine Quarte höher imitiert werden; die Bassstimme soll von einer anderen Bassstimme imitiert werden, die alle Intervalle umkehren (also heruntergehen, wenn die Leitstimme hinaufgeht, und umgekehrt) und um drei Takte nach hinten versetzt singen muss. Es ist dies ein äußerst ausgeklügeltes Gefüge, doch beim Hören genießt man wahrscheinlich einfach nur einen wunderschönen Klangteppich.